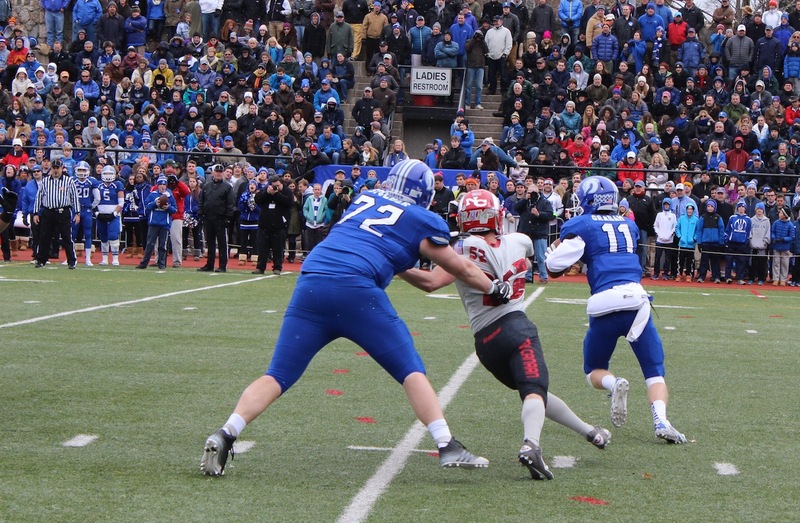 Darien versus New Canaan. Thanksgiving. 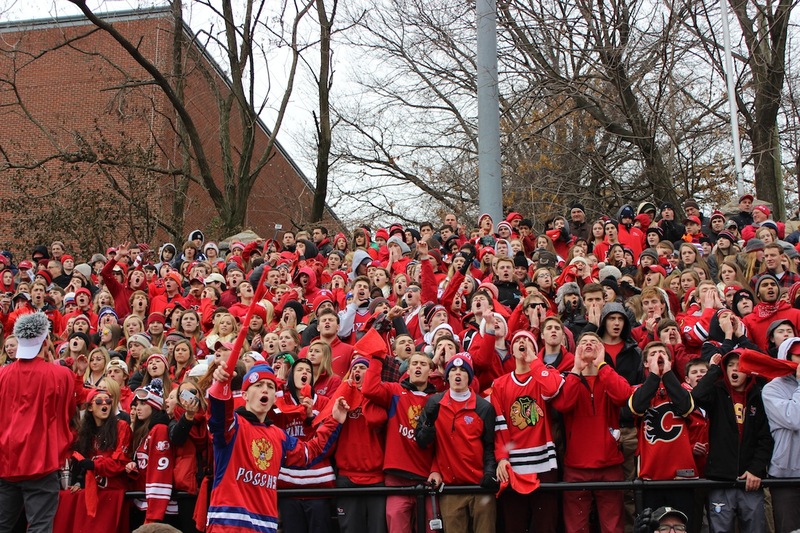 Two heated rivals going head-to-head in front of a huge crowd at a historic venue. Wisps of snow in the air adding to the ambience. A tense, close game filled with excitement, drama and momentum shifts. 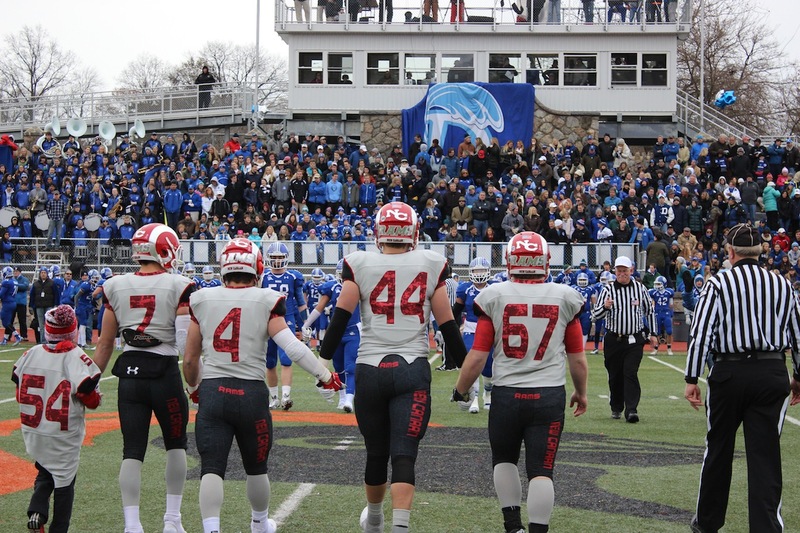 The 2014 FCIAC Championship was a game that had everything you wanted as a football fan. 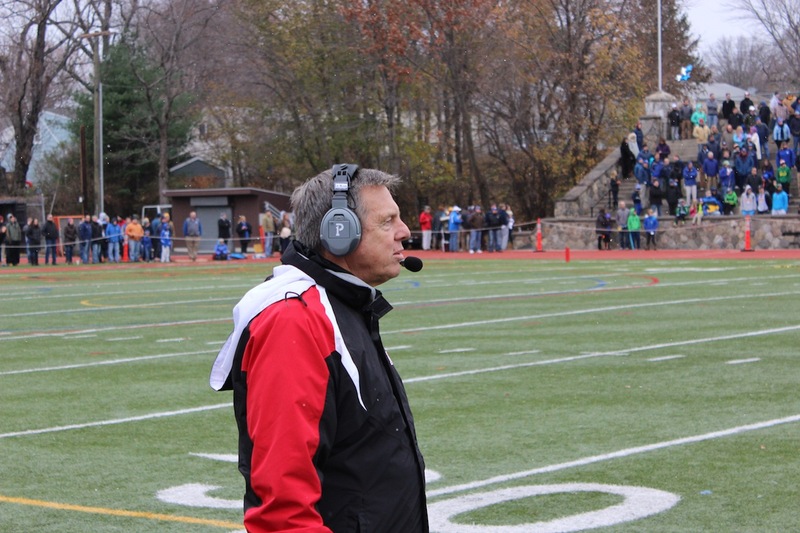 Everything, that is, except a New Canaan win. 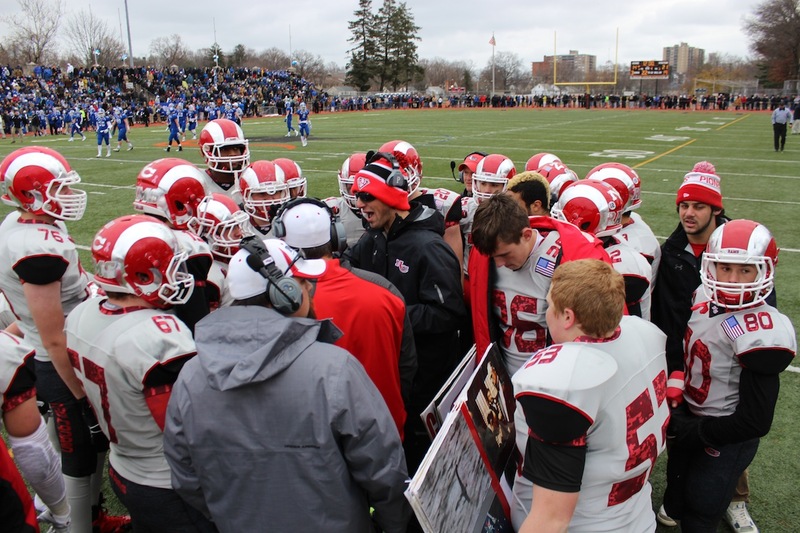 Despite jumping out to a 21-0 lead and having the game seemingly in hand as the 4th quarter wound down, the Rams fell in shocking fashion in overtime to the Blue Wave 28-21 in front of 10,000 fans at Stamford’s Boyle Stadium. The Rams (9-1) were flagged eight times for 57 yards, many of them coming at inopportune times. 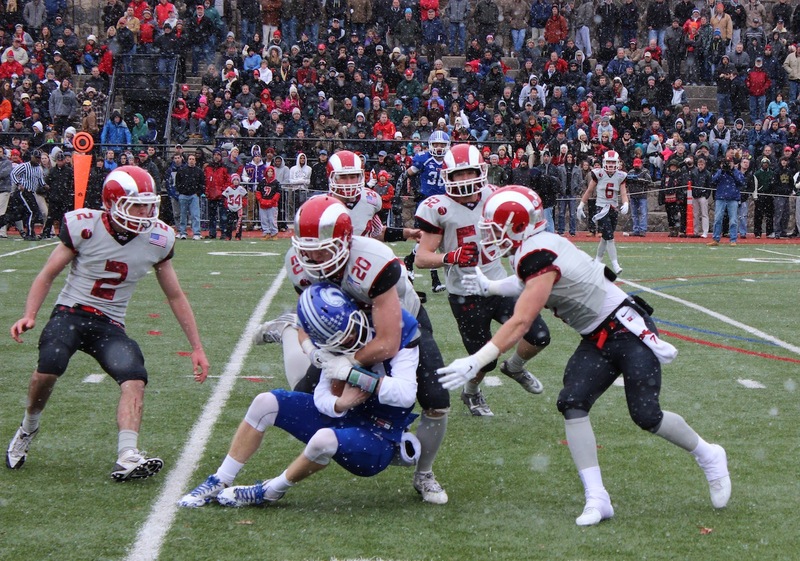 New Canaan also uncharacteristically had four turnovers, including one on the final play of the game. 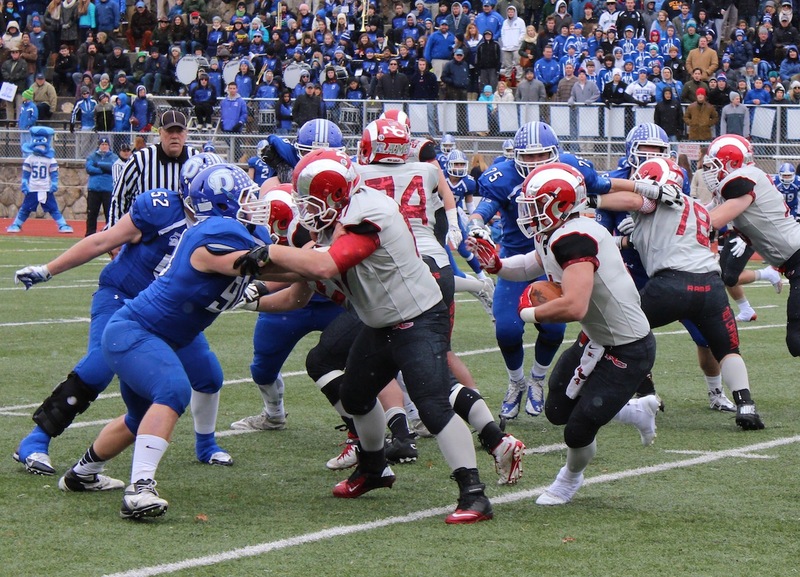 After the Blue Wave scored a touchdown in overtime, New Canaan had their chance to tie it up. 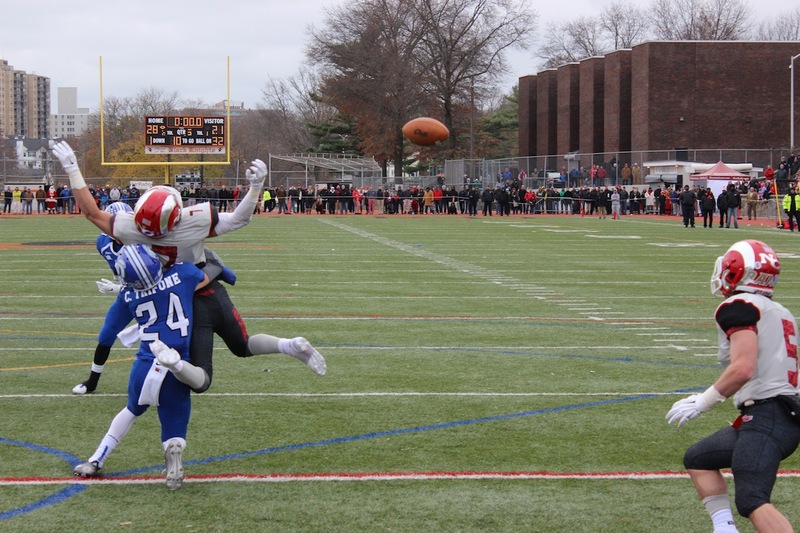 A Mike Collins pass was deflected and ultimately picked off by Darien, capping off a comeback that saw the Blue Wave score 28 unanswered points to win the conference crown. 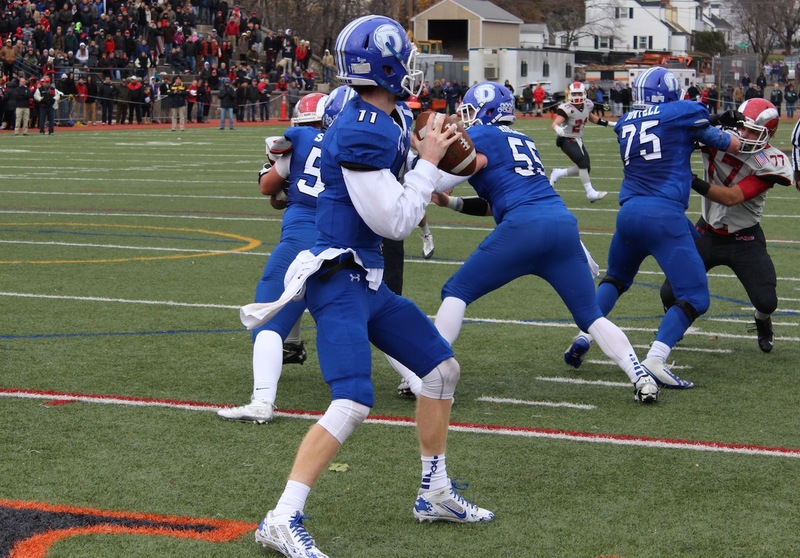 The win secured the first FCIAC title for Darien since 2010, and came despite the Blue Wave (11-0) committing four turnovers of their own. They were also without the services of their top defensive player George Reed, who was relegated to long snapping due to a knee injury. 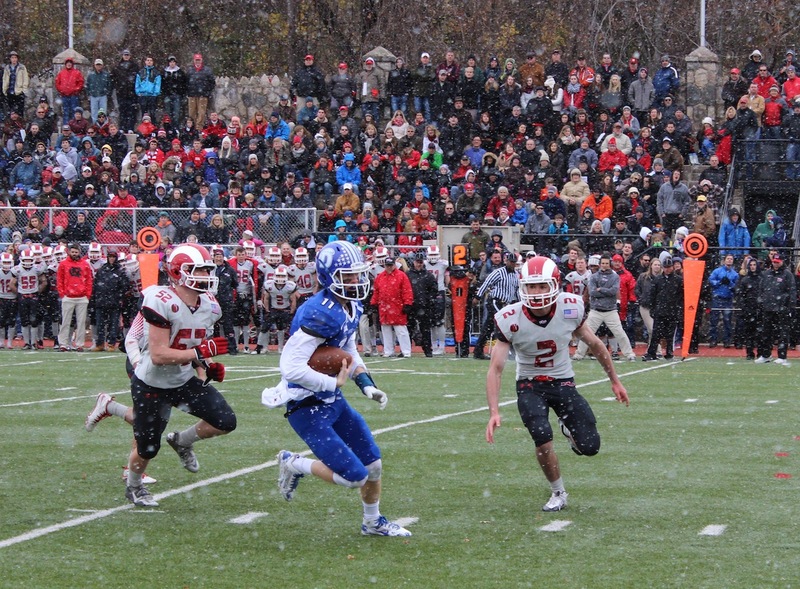 It was also Darien’s third consecutive Turkey Bowl victory over the Rams. The way things started for New Canaan, no one could have guessed the game would end the way it did. 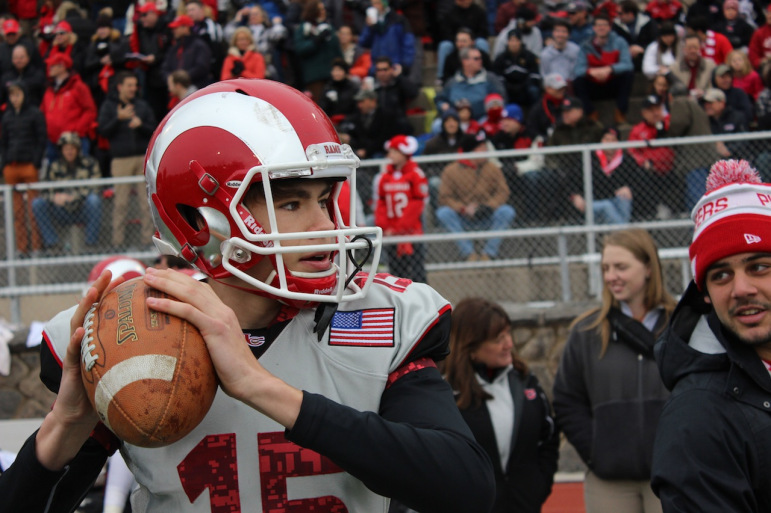 In a three-play span in the first quarter, Collins threw touchdown passes of 46 and 32 yards to seniors Michael Kraus and Alex LaPolice for a 14-0 Rams lead. 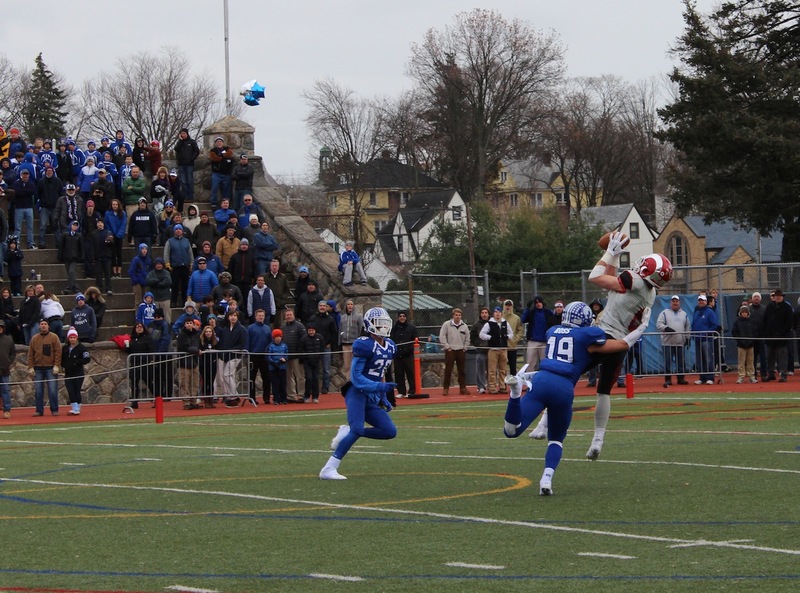 New Canaan would add another touchdown in the second quarter as Collins hooked up with Kraus again on a 38-yard catch and run up the right sideline for a 21-0 lead with 11:05 to go in the half. 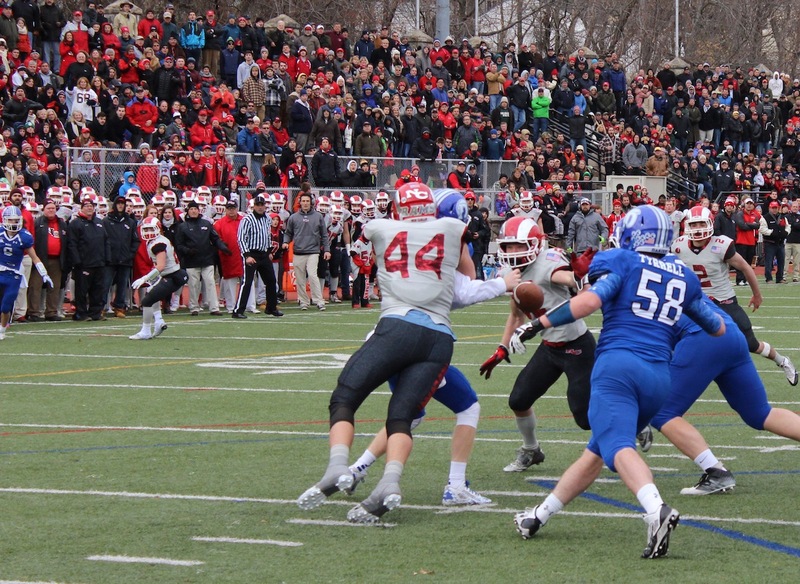 Meanwhile, Darien could not get anything going against New Canaan’s defense. Blue Wave quarterback Timmy Graham fumbled and was picked off by LaPolice and senior Sterling O’Hara. 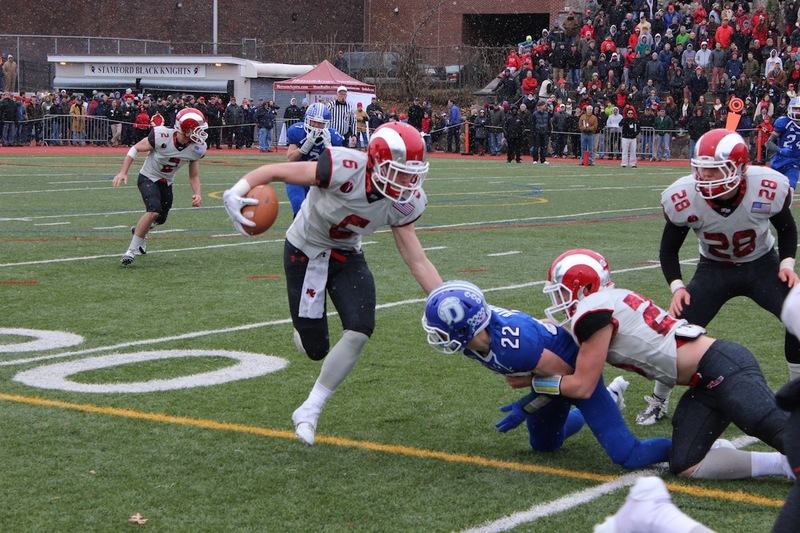 O’Hara’s pick set New Canaan up at the Darien 22-yard line, and the Rams moved as close as the Blue Wave 9. 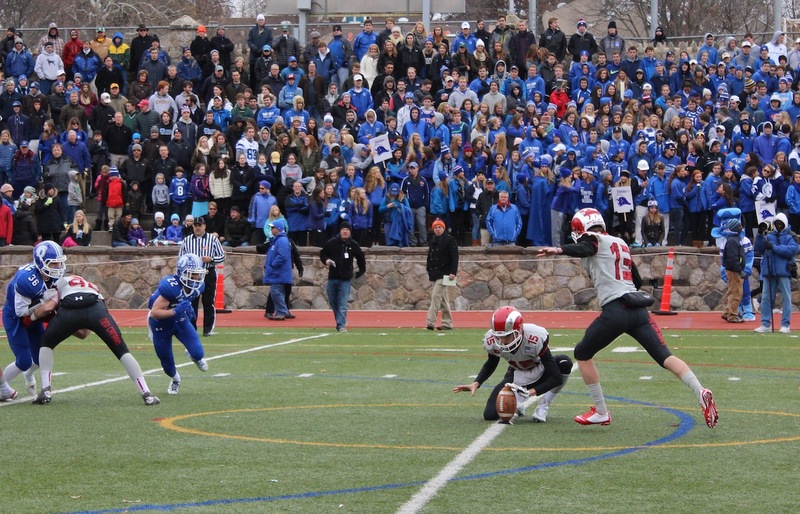 New Canaan would come away with nothing to show for it after junior kicker Peter Swindell missed a 26-yard FG. From there, the Blue Wave began to gain some momentum. The offensive line began giving Graham time, and the junior QB responded by engineering an 80-yard drive as time wound down in the half. 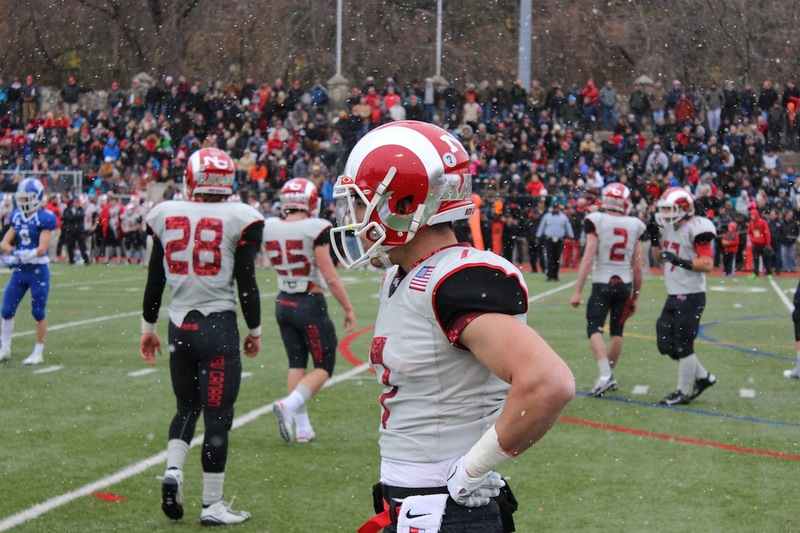 Graham hit Colin Minicus for a 12-yard TD with just 7 seconds left in the half to close the Rams lead to 21-7. 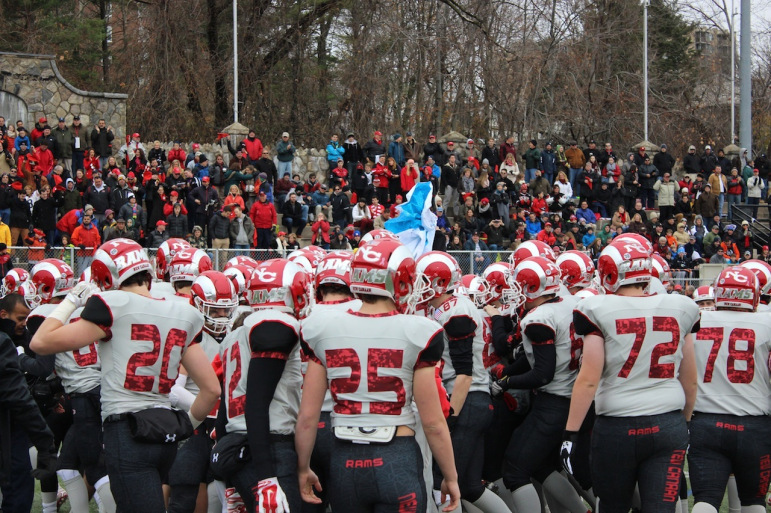 On the first possession of the second half, New Canaan seemed to turn the tide against the Wave when Kraus picked off Graham at the New Canaan 25. However on the first play from scrimmage Collins was hit and fumbled and Darien’s Mark Evanchick recovered the ball on the Rams 22. 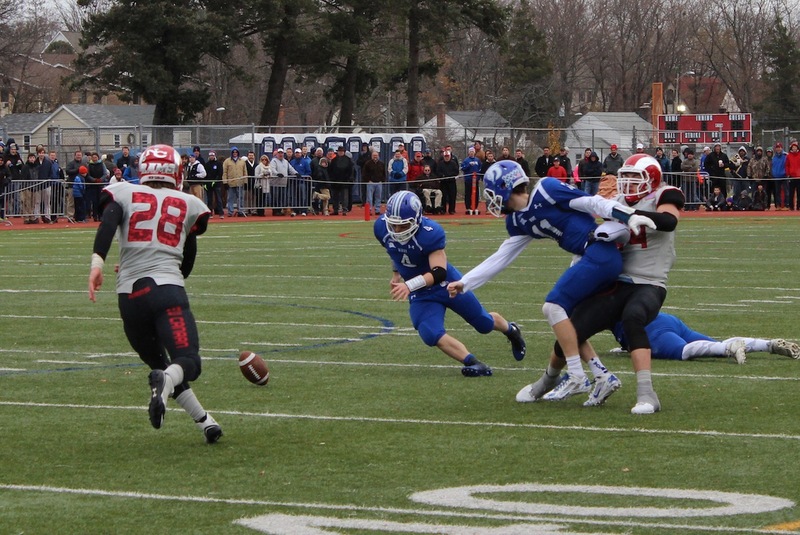 Five plays later Darien’s Peter Archey scored on a 1-yard run and the Blue Wave were within a touchdown, trailing 21-14 with 8:05 left in the 3rd. Both defenses stiffened throughout the balance of the 3rd quarter and into the 4th, as the teams traded punts and field position, looking for a game changer. 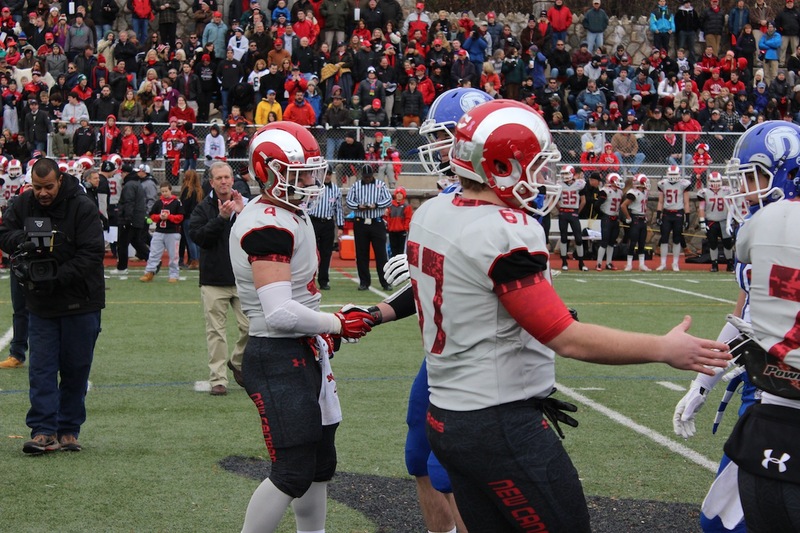 On New Canaan’s second possession of the 4th quarter the Rams seemed to find just that. 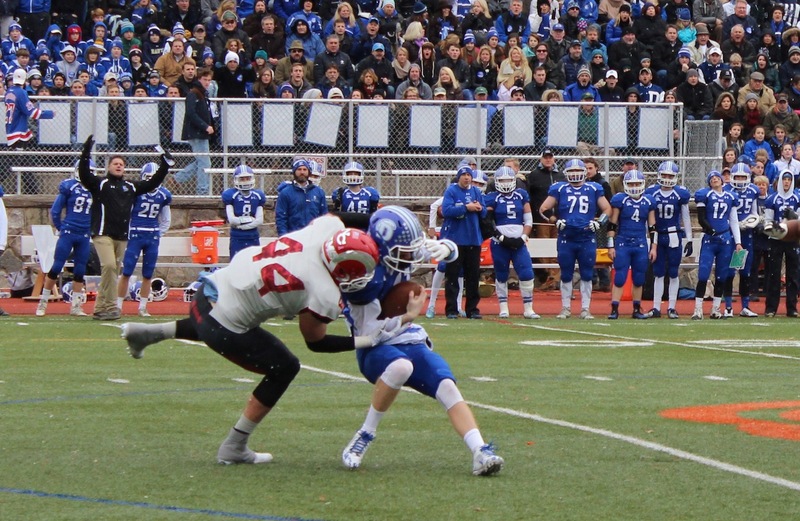 Collins hit Kraus over the middle for a 38-yard gain, setting New Canaan up on the Darien 3. 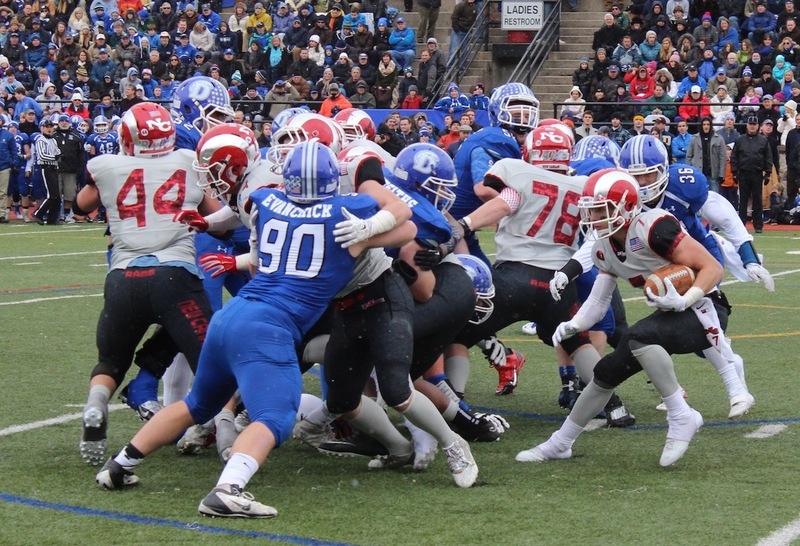 Two plays later, however, a New Canaan fumble was recovered by Darien’s Kevin Fitzmaurice at the 9-yard line, and the Wave were still alive. 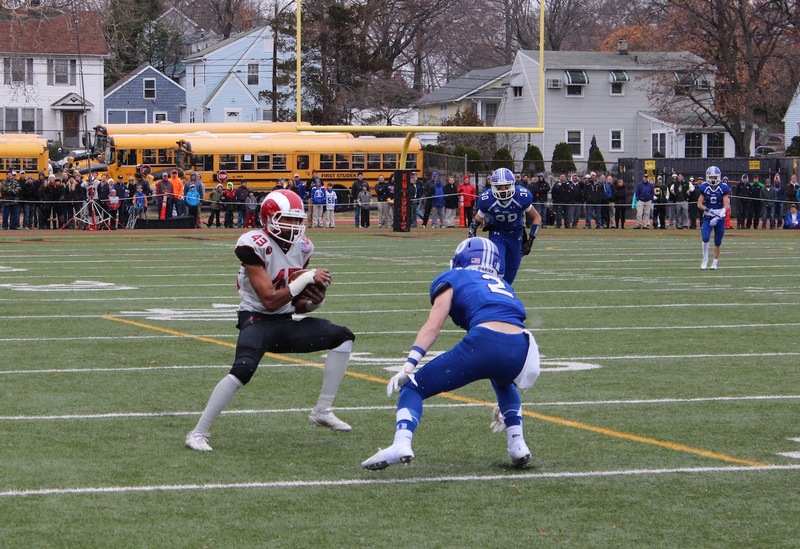 The Rams seemed to take control of the game right back three plays later as Allen’s strip of Graham was recovered by Malaki Holden at the Darien 8. 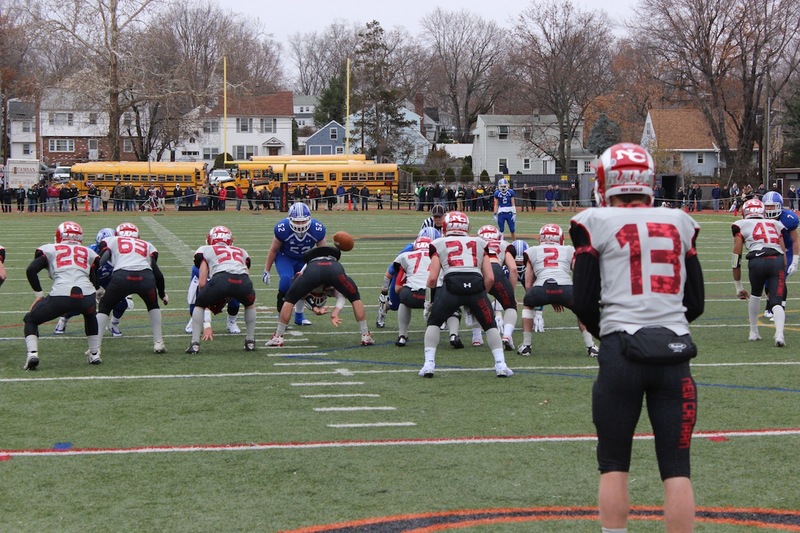 A holding penalty backed New Canaan up to the 18, still well within Swindell’s field goal range, which would have potentially given the Rams a two-possession lead with time winding down in the game. 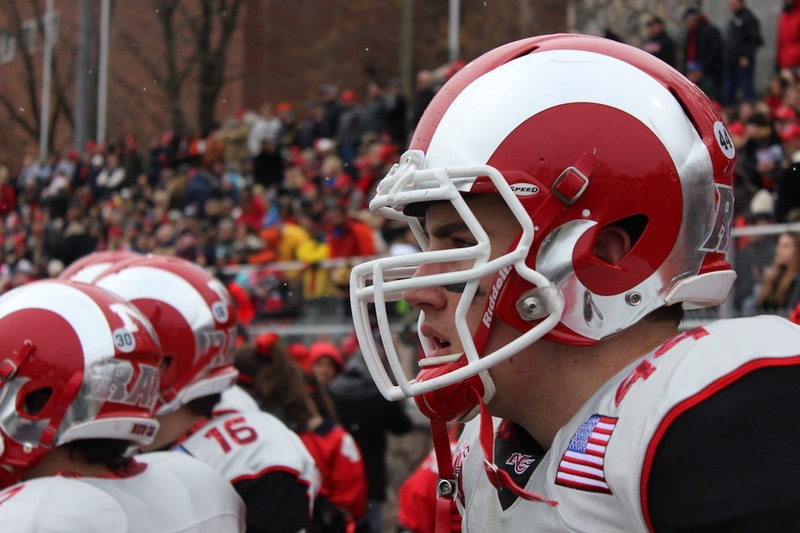 On the next play, the Rams set up in a Wildcat formation with LaPolice taking the snap. The senior co-captain floated the pass up over the middle, intended to be a jump ball for the 6’6” Allen, who was lined up at tight end. 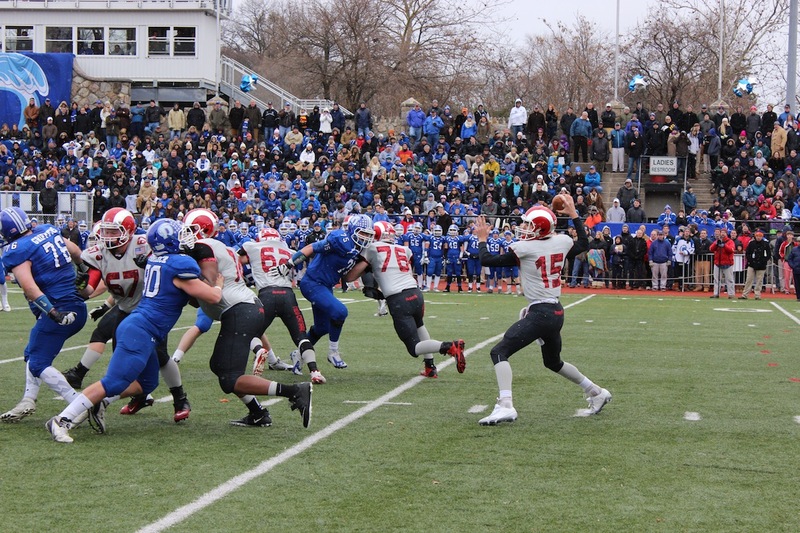 Instead, the ball was picked off in the end zone by Darien’s Hudson Hamill, and returned to the Darien 6-yard line. The Wave had 94 yards to move, and 4:46 left in the game. 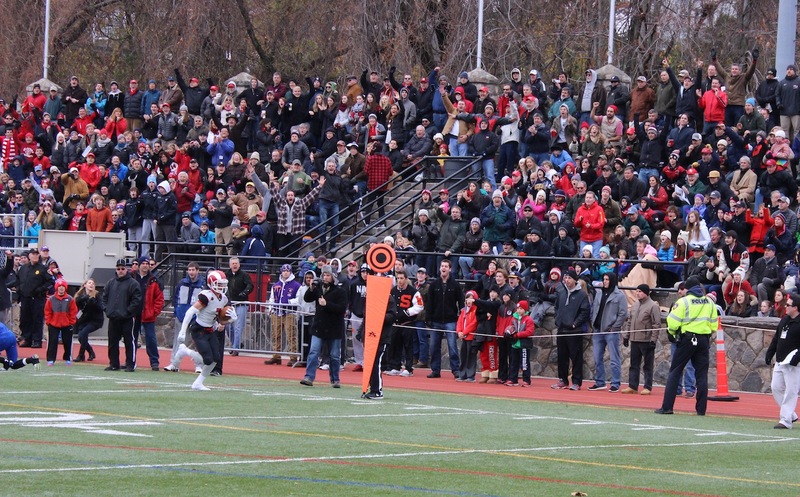 On second-and-11, Graham heaved a pass deep down the right sideline. 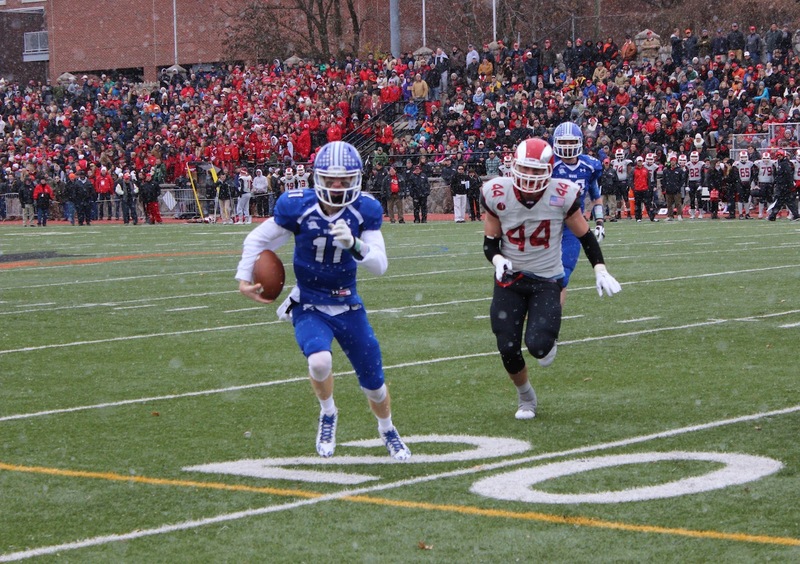 Will Hamernick made a spectacular catch and ran it down to the New Canaan 39-yard line, good for a 56-yard gain. 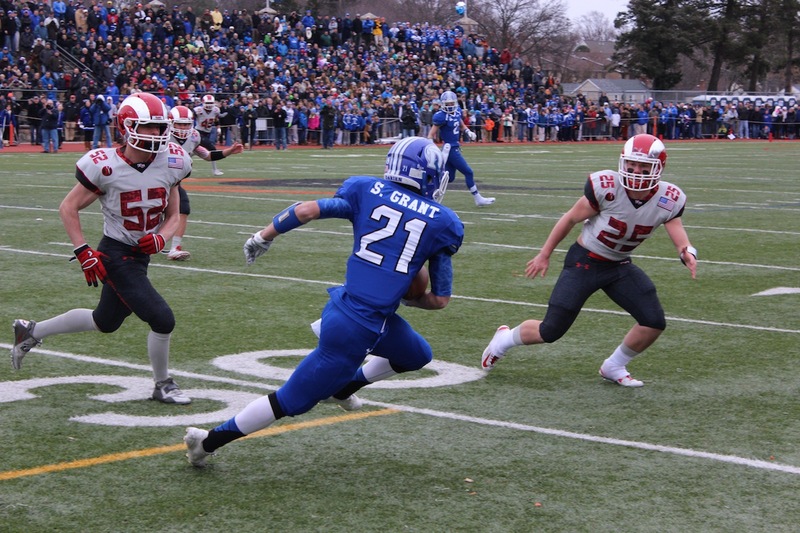 Two plays later Graham connected with Todd Herget for 37 yards at the New Canaan 2. 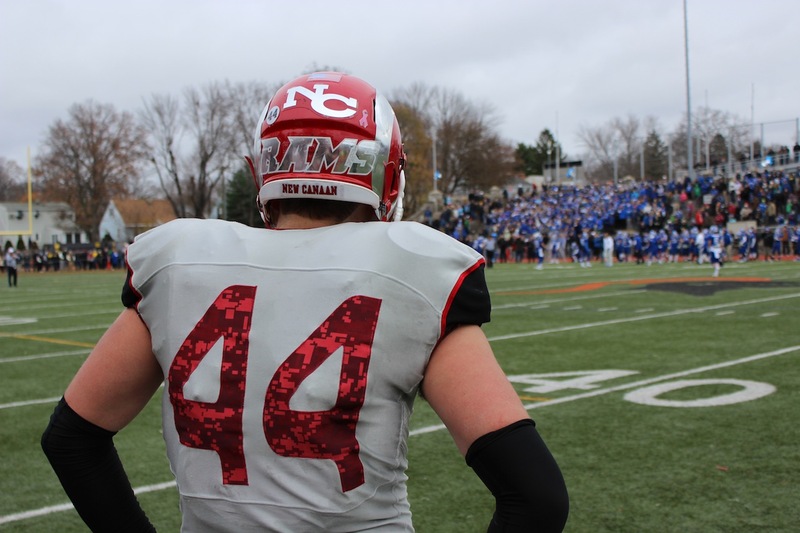 One play later Archey pounded the ball in with just over 2 minutes left in the 4th. 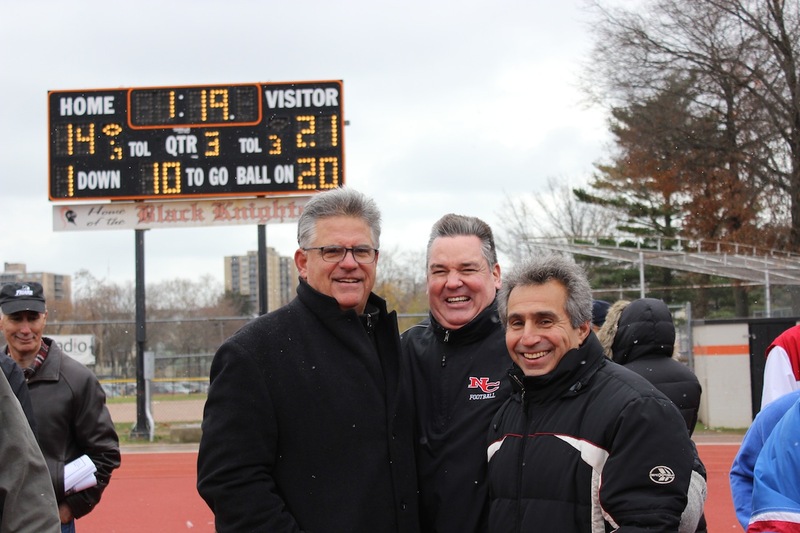 Incredibly, the game was tied at 21 and headed for overtime, where both teams would get a chance to score with the ball placed at the 10-yard line. 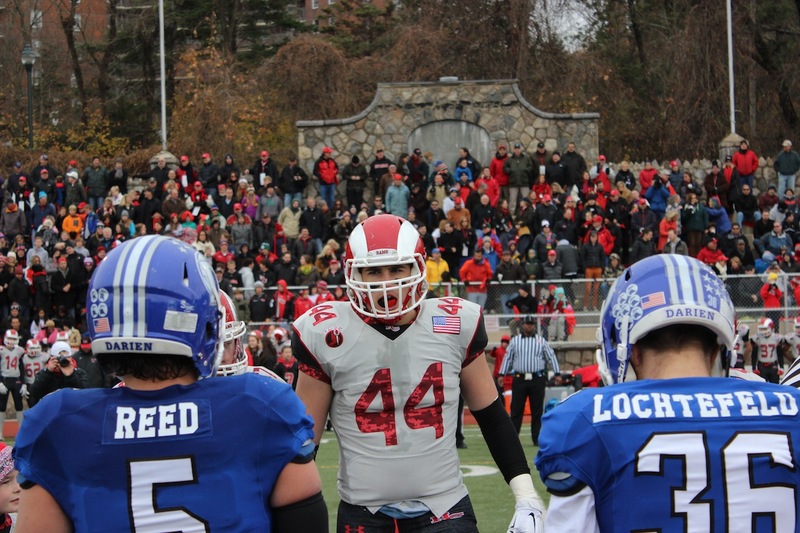 New Canaan won the toss and elected to go on defense first. Graham took the first play from scrimmage up the middle for a 4-yard gain, but came off the field holding his arm. 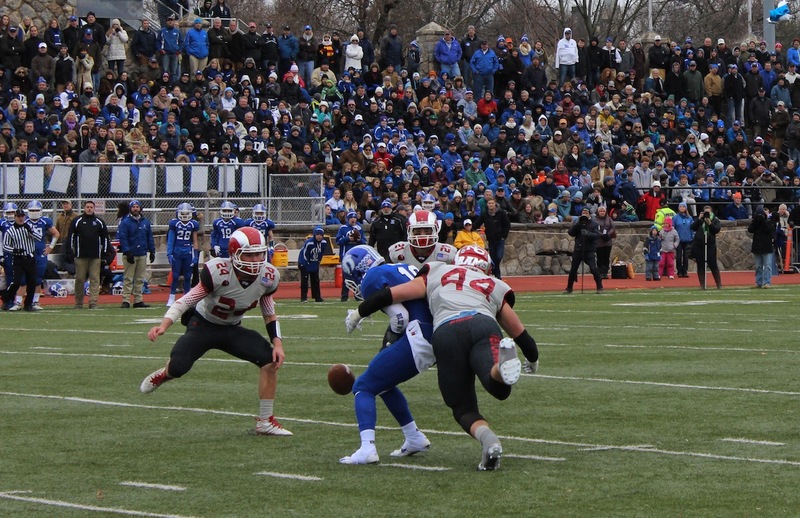 Hudson Hamill moved behind center to take the snap. Faking a handoff, Hamill rolled out and found Griffin Ross wide open in the end zone. 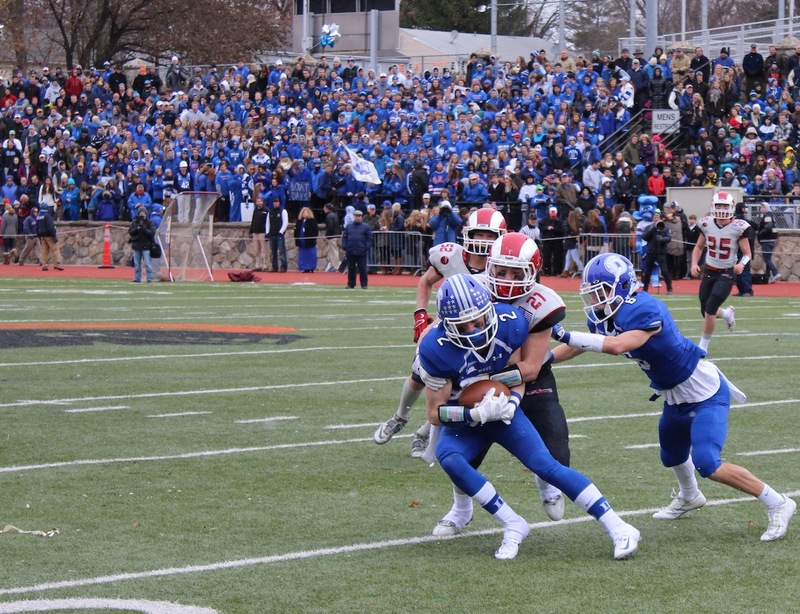 Darien had a 28-21 lead. 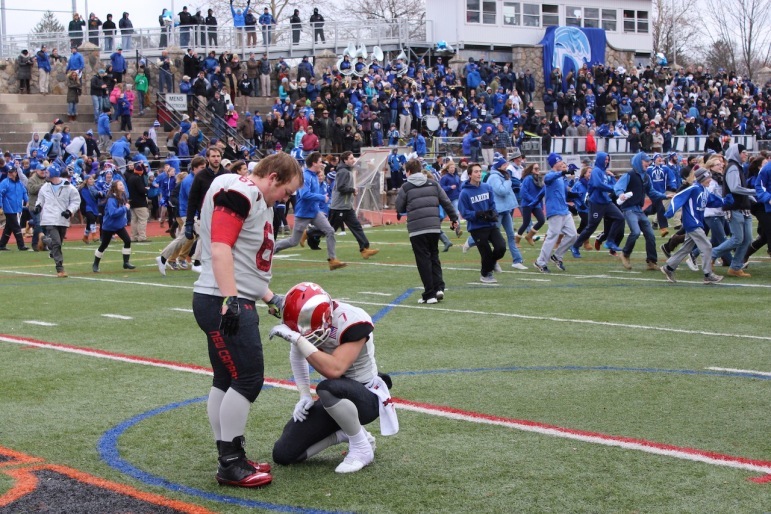 Now it was New Canaan’s turn. On first down, a bubble screen to Kraus went nowhere. On second down a quick slant to Kraus was broken up. 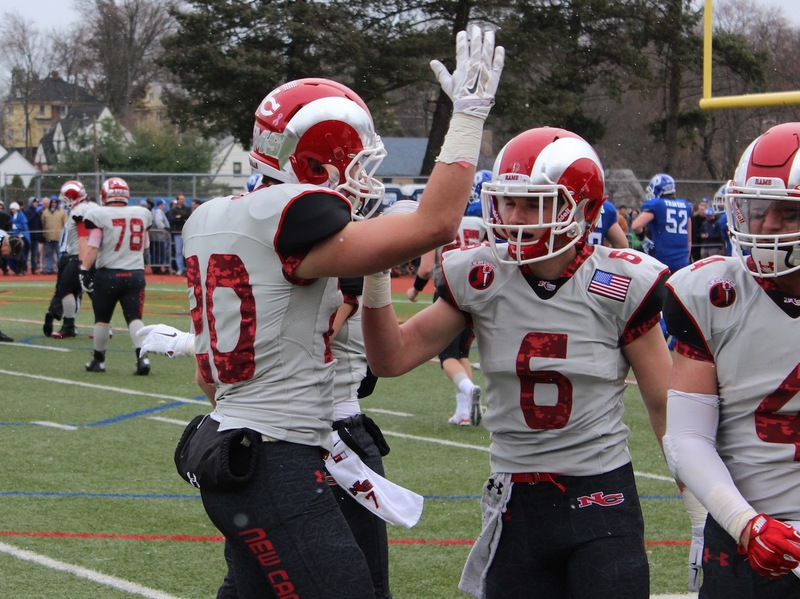 On third down, Collins looked for LaPolice over the middle, but Darien’s Christian Trifone was able to break up the pass which was thrown slightly behind the Rams senior co-captain. The ball popped up in the air where it was intercepted by Bobby Trifone. 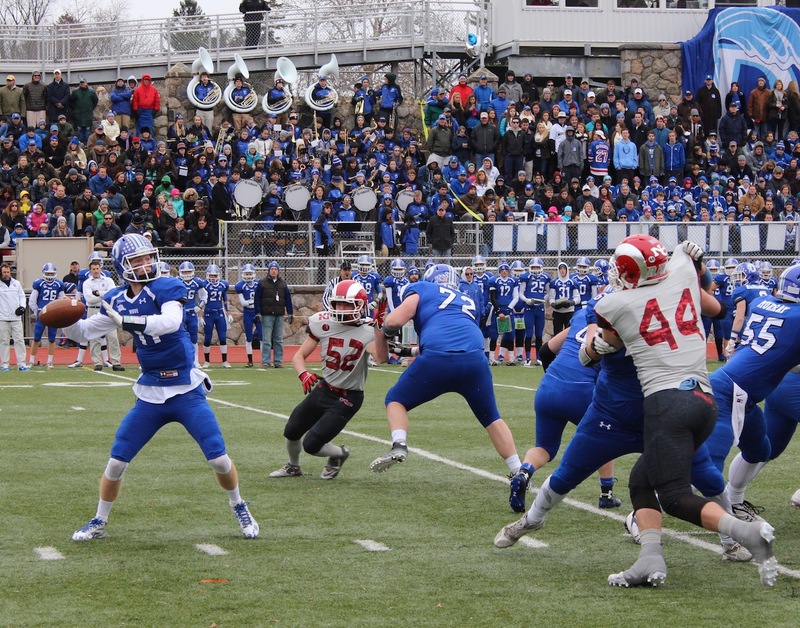 Blue Wave had won the 49th – and possibly the final – FCIAC Championship. 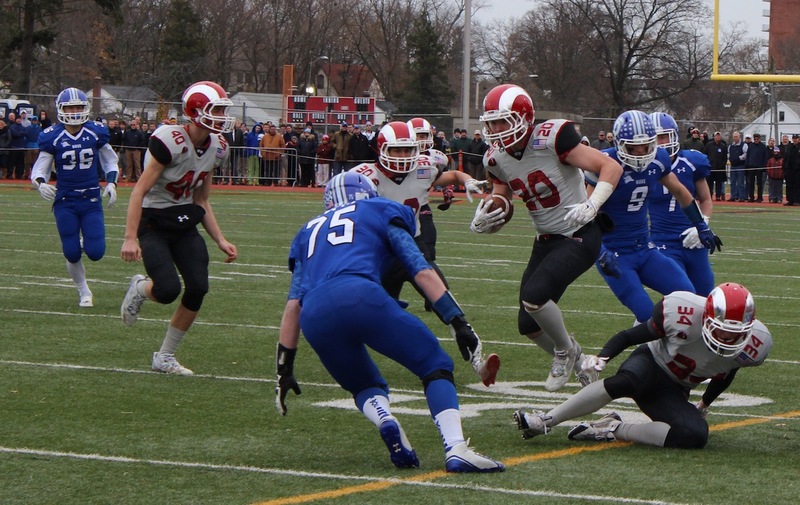 For the Marinelli and the Rams, it was a painful loss but one that might be alleviated with a solid showing in the state tournament where another collision course with Darien seems to be a likely scenario. The Rams will play No. 3 Wethersfield in the Class L semifinal at Dunning while the top-seeded Blue Wave will host No. 4 Naugatuck. 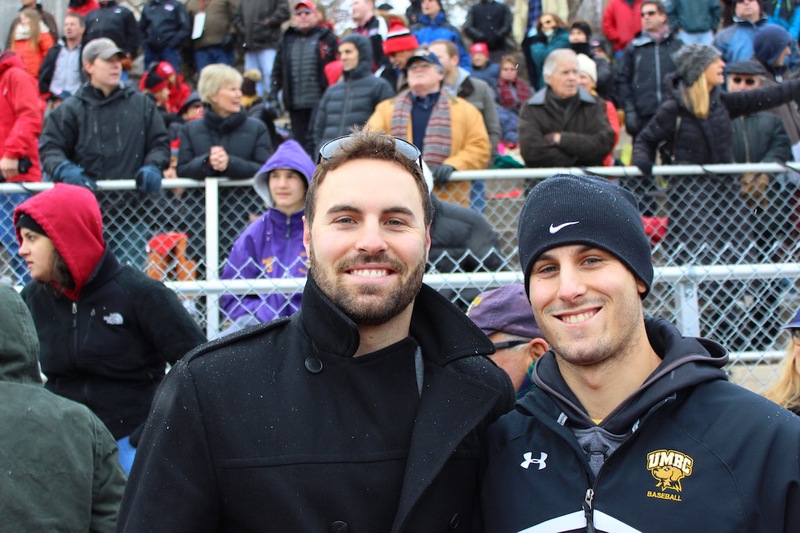 New Canaan High School Class of '09: How Have Your Five Years Been?